Oh, yes. 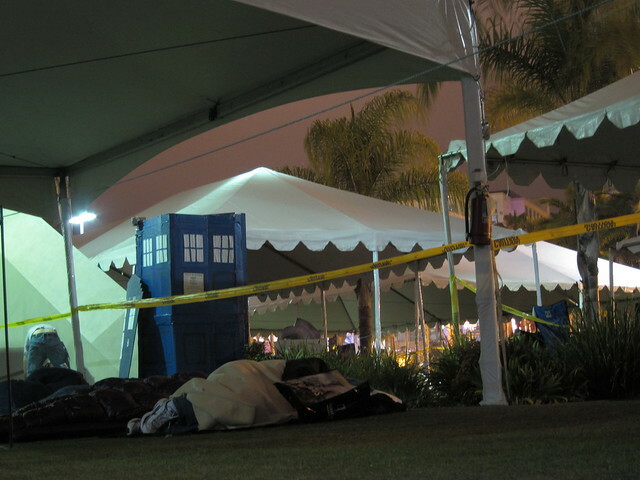 Sleeping on the lawn outside Hall H on Saturday night. I slept pretty solidly for a good five hours, which was the most sleep I'd had for the whole convention. Maybe I was getting comfortable with camping out, since I'd already done it once. Maybe I was more relaxed than the previous night because I was with people I knew. Maybe I was just exhausted. In any case, I was surprised to find it light out when I woke up; I thought I'd be up before dawn and have time to wash up before the bathroom got busy. (And, NO, it did not rain a drop. There wasn't even any dew.) I woke up very, very stiff and sore, but all considered, I felt pretty good. karenor, who had slept not a wink, commented that I'd slept through a lot, and I agreed that I probably had (my only memories were of being cold and wrapping up more tightly once or twice, and a little commotion when a loud vehicle passed). I thought she was kidding when she said Nathan Fillion had visited at 3am, and I'd slept through that. So, yeah. I wasn't too happy about that. Someone suggested trying the Hilton instead of the convention center for bathrooms, which turned out to be a good idea. 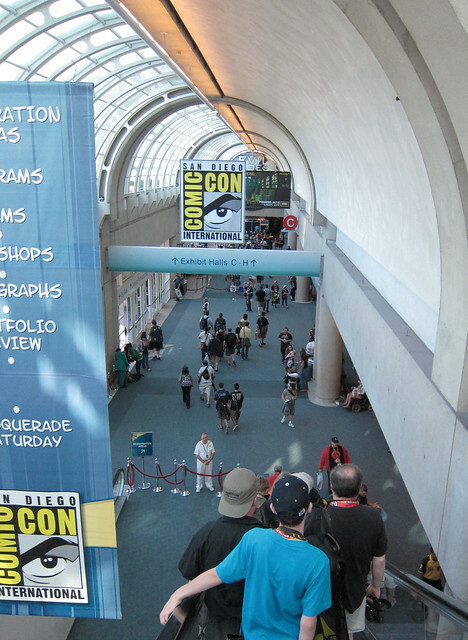 It was nicer than the convention center, and not as crowded. I hadn't planned to sleep out a second night, so I had not brought more clothes, but I did my best to wash up. My best was not very good; all I could hope was that in a crowd of 6500 I would not stand out as the grossest person. It's a low bar. 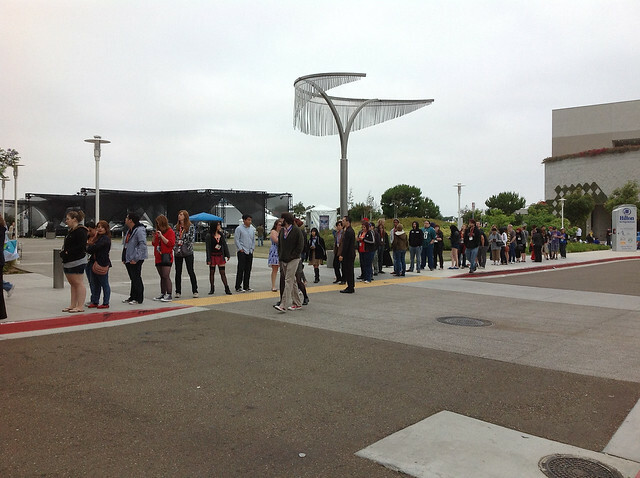 This was the line for coffee by the Hilton. There was more off to the left, where it then curved around to the Starbucks. 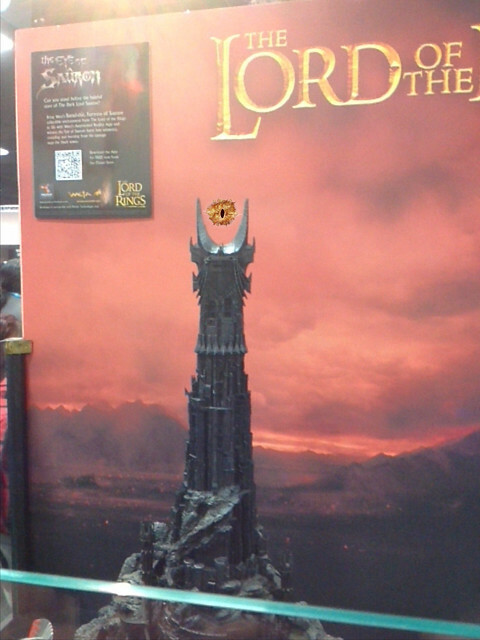 I couldn't properly capture the scope of it. For breakfast, I got a blueberry muffin at the Hyatt. It was delicious and it was only $1.50. "This is the best thing I've bought all weekend," I told the cashier. Between my (comparatively) late sleeping and the (comparatively) early start for the Hall H panels (10:00am, instead of 11:30 like on Saturday) there wasn't too much time to kill. We packed our stuff up, and the line compressed at 8am. But not very far, because every person in front of us seemed to have let a couple of friends join them in the morning. The line, I swear, had doubled. At least. There is a word for people who show up in the morning and get in front of people who slept out all night. It is a rude word. 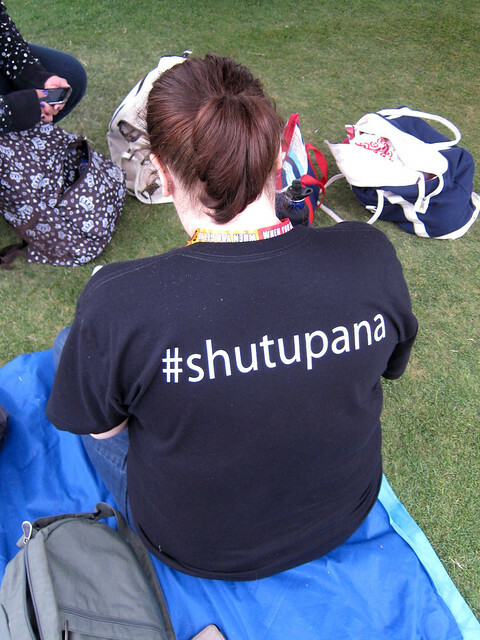 karenor had the best t-shirt. She's been reading 50 Shades of Grey, so the rest of us don't have to. This hashtag gets used a lot in the discussion. 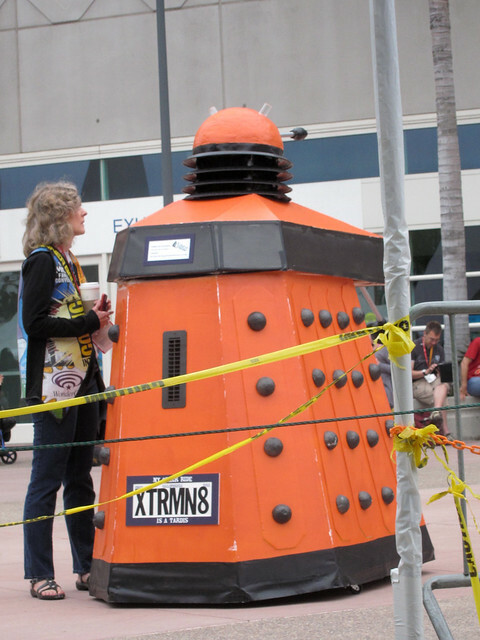 This Dalek's been at the con for the last few years. 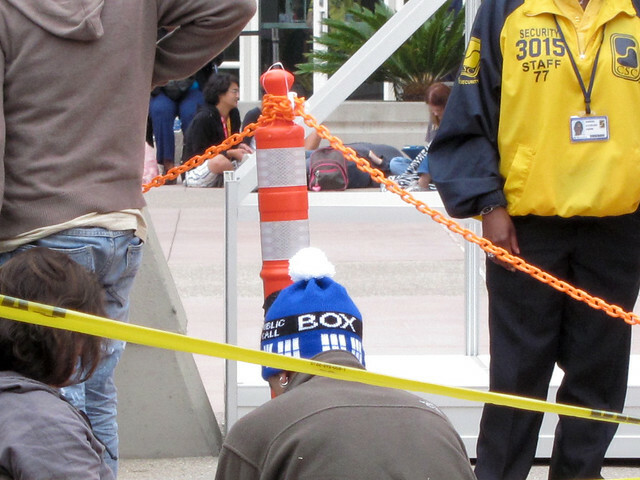 "My other ride is a TARDIS," says his license plate frame. 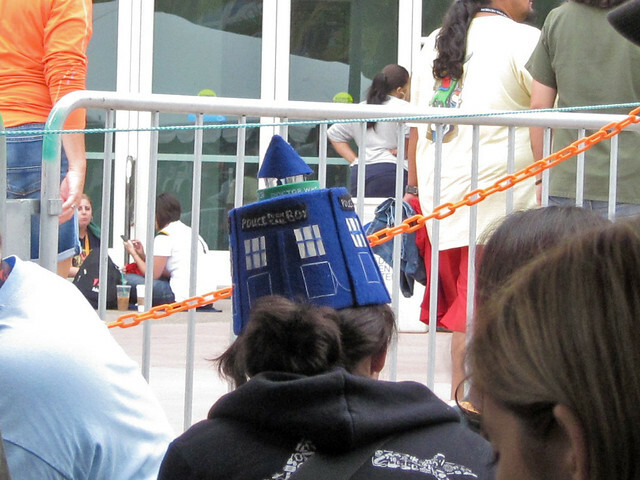 TARDIS hats were popular this year. 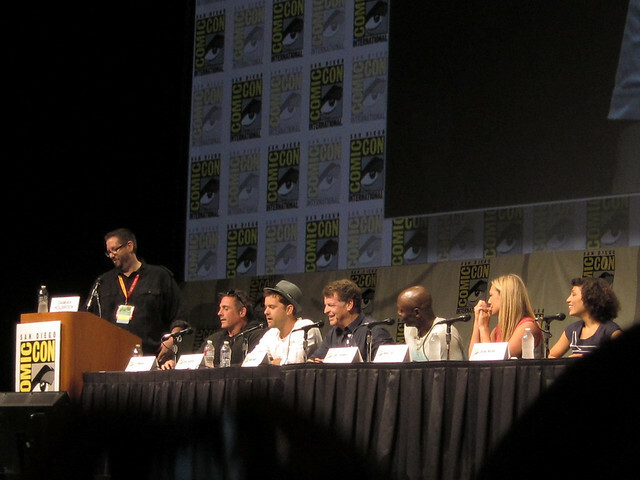 Finally, they let us into Hall H.
Hall H really is just that hallucinatory after a couple of days. We spread out looking for seats, and I just missed getting four together in the last row of the first section when I didn't realize the guy pointing to them was an usher and not some guy calling his friends. Dammit. Falling back, I ended up exactly where I'd been the previous day, and I shouldn't have, because I'd been closer in line. I probably could have snagged a single seat somewhere in front, but the groups of seats went fast and it was chaotic and I didn't know where my friends were, and that got a little stressful. 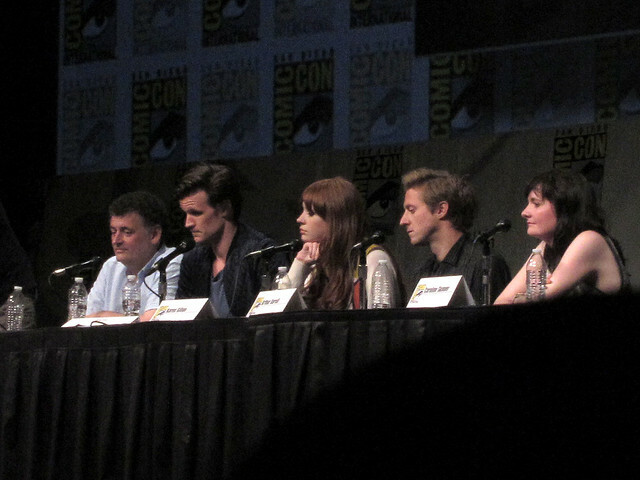 The Fringe panel was first. They'd distributed fedoras to all of us on the way in, so that wins the prize for best swag (swag was very slim this year – between me and Ken both, we only got a redemption ticket at one panel, the Arrow panel. For an Arrow comic book. We didn't bother). 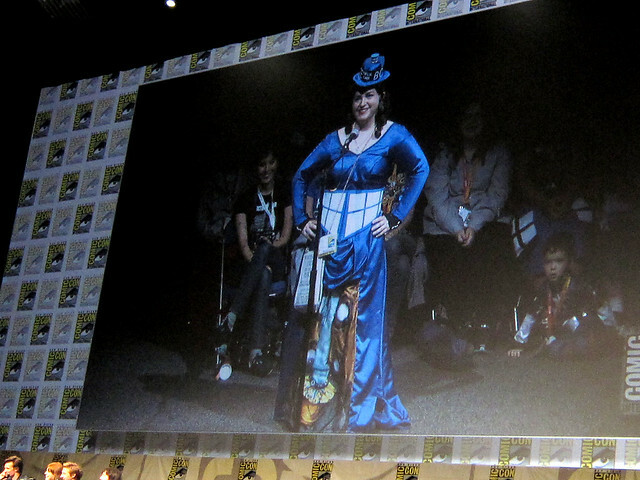 As one of the #hallh tweets said, the crowd was looking very dapper. Ken and I only watched Fringe for a few episodes when it first started, back when Gross Improbable Problem of the Week was always solved by Convenient Improbable Experiment From Walter's Past. But I've heard repeatedly that the show got good after that, and that it developed a coherent mythology that actually went somewhere. The panel encouraged my interest. I like people who seem passionate about the show they're making, and the things they brought up sounded interesting. So we may give Fringe another try. 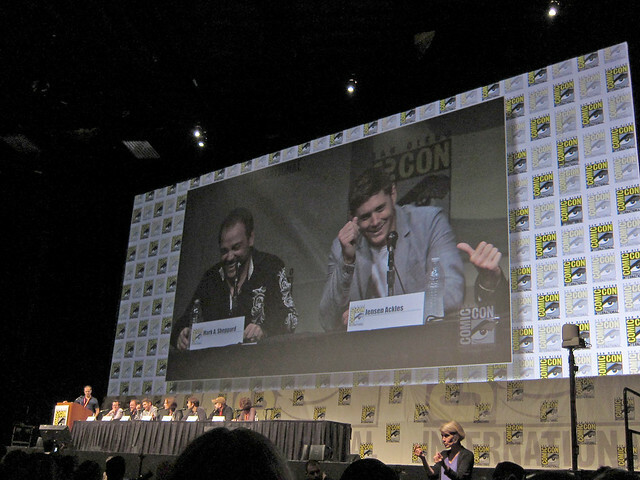 I'm afraid my biggest reaction was "Hey, Mark Sheppard!" 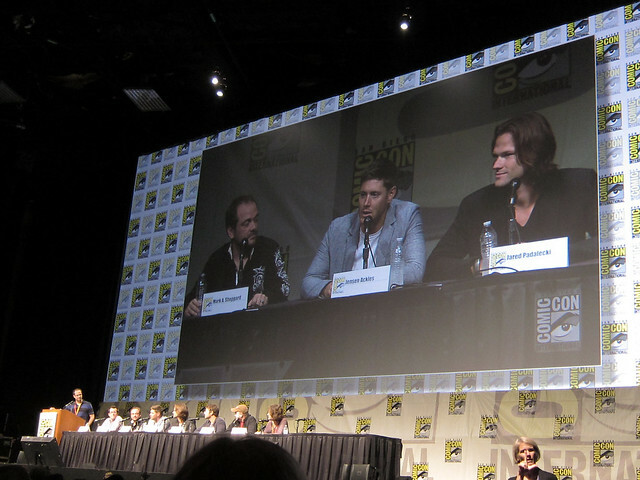 I would happily have traded bodies with a fan of Supernatural for this hour; if only it worked that way. 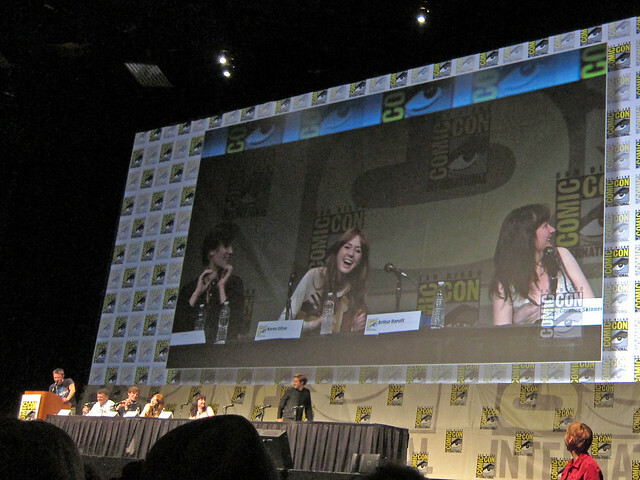 That said, the guys were pretty funny (and very aware of certain types of fan fiction). 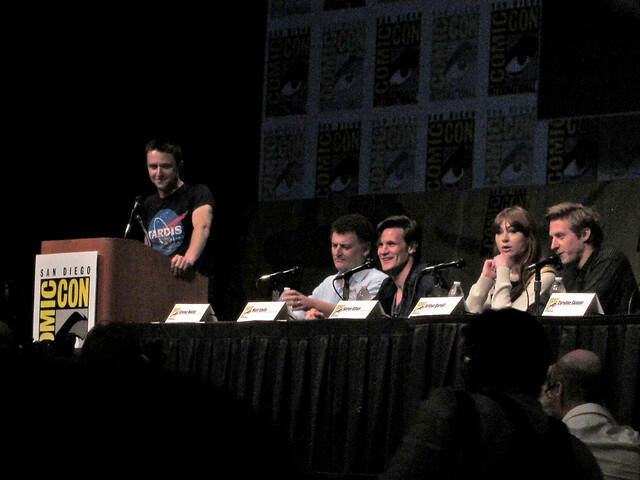 And then Chris Hardwick was up to moderate the Doctor Who panel (of course). He'd worn a Ten costume the previous day, and Matt caught him. Tsk. 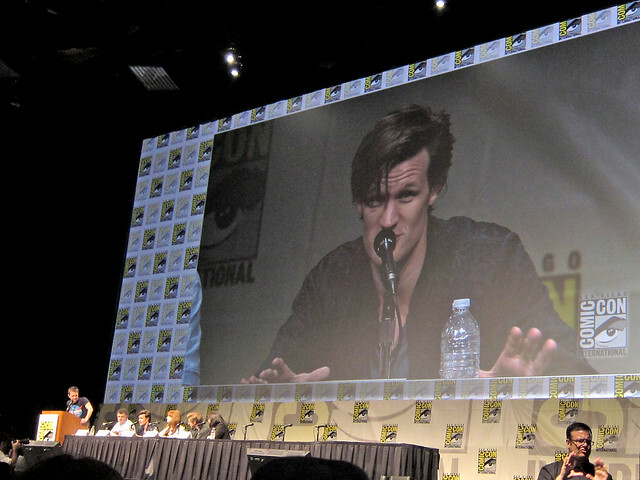 In his defense, as he said, he doesn't really have the right look for Eleven. 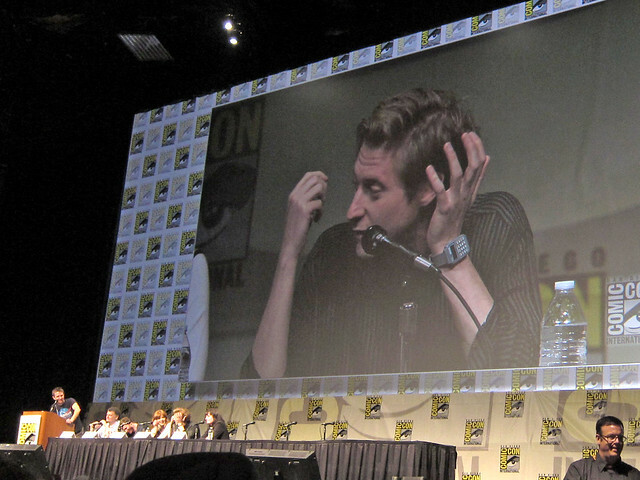 Arthur Darvill has the best Twitter (@RattyBurvil). You should follow it. He has a lovely deadpan wit and a fondness for owls. Also a... calculator watch? WHAT IS WITH THE ELBOW CAM. 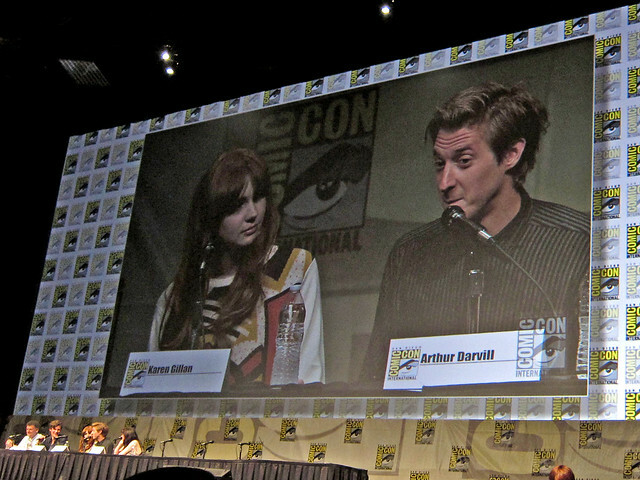 I wish Arthur had had more opportunity to talk on this panel, but his impression of Karen was hilarious. 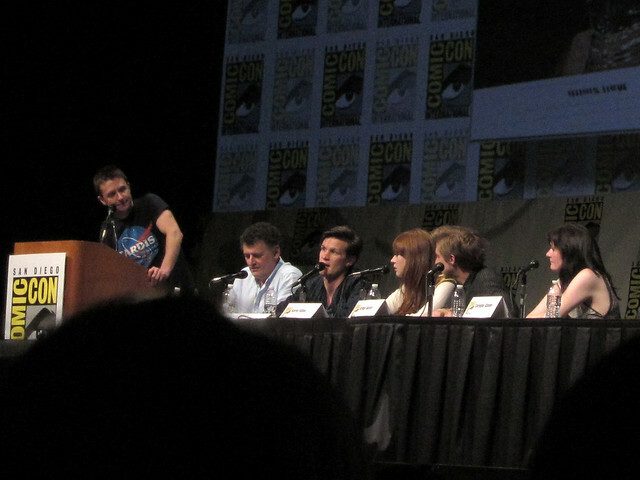 Every time Moffat opened his mouth, I cringed, thinking what fandom would make of what he said. I'm never really bothered on my own behalf so much as I'm wincing at what fandom will do with it. The man's a chain-yanking troll. But so was RTD. I sort of expect it. I've seen her around a lot, but I still like the dress. It has an interior! 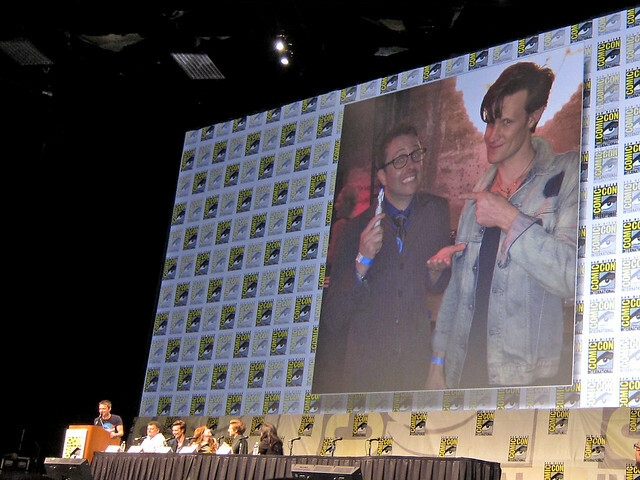 Hall H cleared out en masse after Doctor Who. I said goodbye to karenor and missperkigoth, expecting (correctly) that I'd quickly lose them in the crowd. 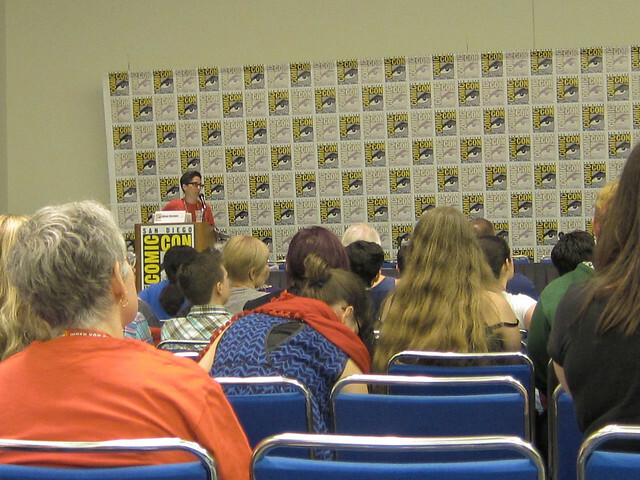 I also wanted to hurry over to see if I could catch any of Alison Bechdel's spotlight panel. It was starting right at 1:30, when the Doctor Who panel ended, but all I had to do was get to the next door of the convention center and up the escalator. Ha, ha. Me and 6500 other people. Even going with the flow, it took me half an hour. So there I was, carrying my giant backpack full of bedding (I'd have liked to check it at some point, but bag check was full), sweaty and disheveled from two days of sleeping outdoors, in Friday's shirt, wearing leggings as pants (I'd worn them overnight because it was cold, and never found a good time to change). And that's how I walked into Alison Bechdel's quiet, attentive, maybe two-thirds full panel, half an hour late. 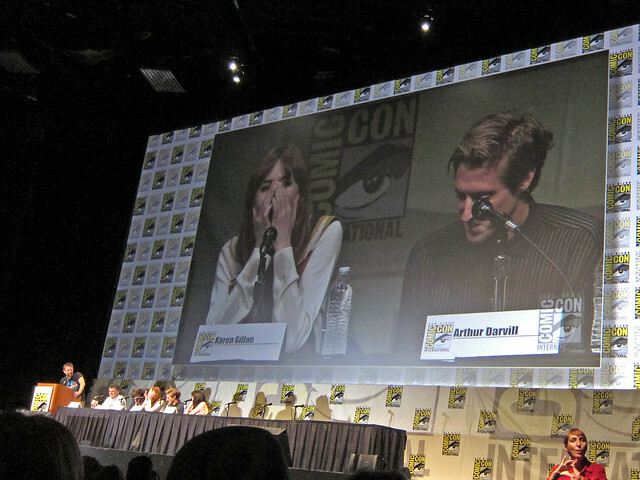 An intimate little panel like that is much more my speed, but I was having trouble shifting gears after Hall H. It was SO quiet, and I felt SO conspicuous. 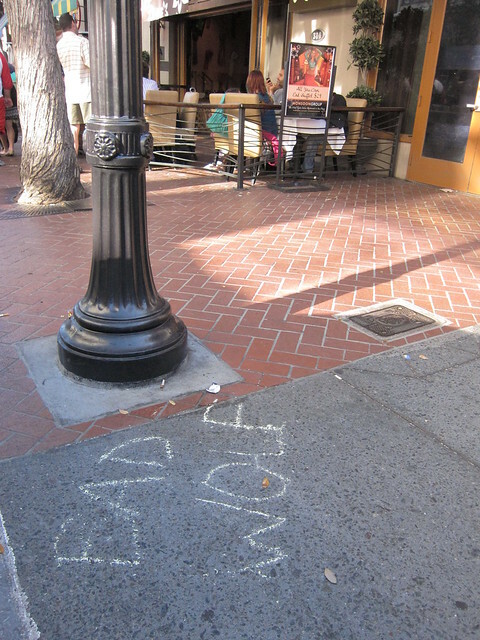 I took a picture – nobody else was taking pictures, but it was Alison Bechdel! Finally! I wanted visual proof! She was showing some slides and reading, and I watched for a while, but I was really feeling the clock ticking, because I wanted to hit some specific things in the exhibit hall and then meet Ken at Starship Smackdown. I had less than an hour to spare. The exhibit hall is huge and slow to navigate. So just as they were going to start the Q&A – which I would dearly have loved to stay for – I left. 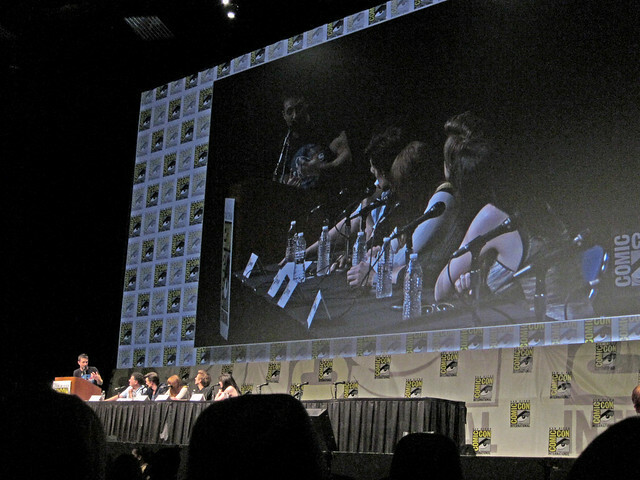 I can just imagine that from everyone else's perspective – halfway into the panel, this scruffy, sweaty lady walks in, loaded down like she's been backpacking in the wilderness. She takes a picture... watches for a few minutes... and leaves. 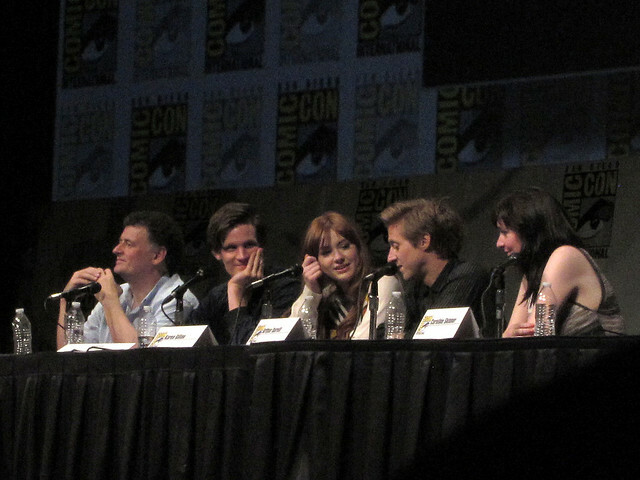 Someone must've thought, "Man, I guess she stumbled into the wrong panel." THAT WAS AWKWARD. 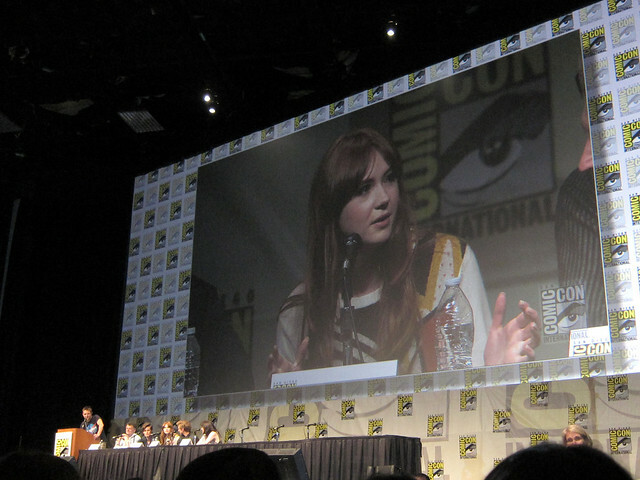 But I really wanted to see at least a little of her panel! So then my giant backpack and I went to the exhibit hall. The very crowded exhibit hall. I apologized to just about everbody I bumped into, honest. 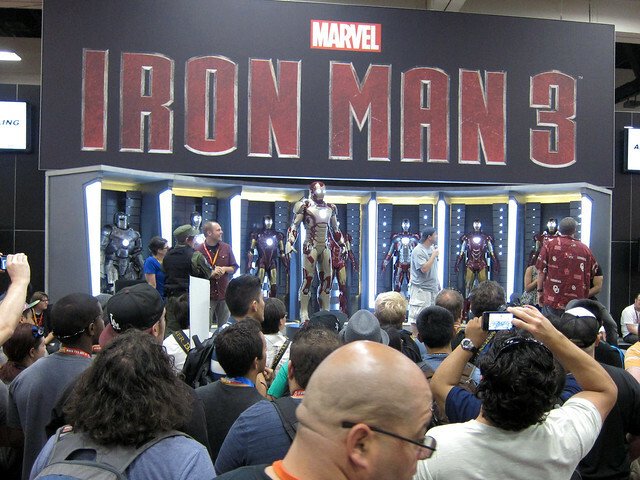 I took one more pass by the Marvel booth, for old times' sake, and hey, they'd put up the armor from the new movie. I've got to say, it's not my favorite. It resembles the suitcase armor, which was one of the ugliest versions. Too much silver, too scaly. Like a really weird crustacean. (Here's someone else's better picture.) 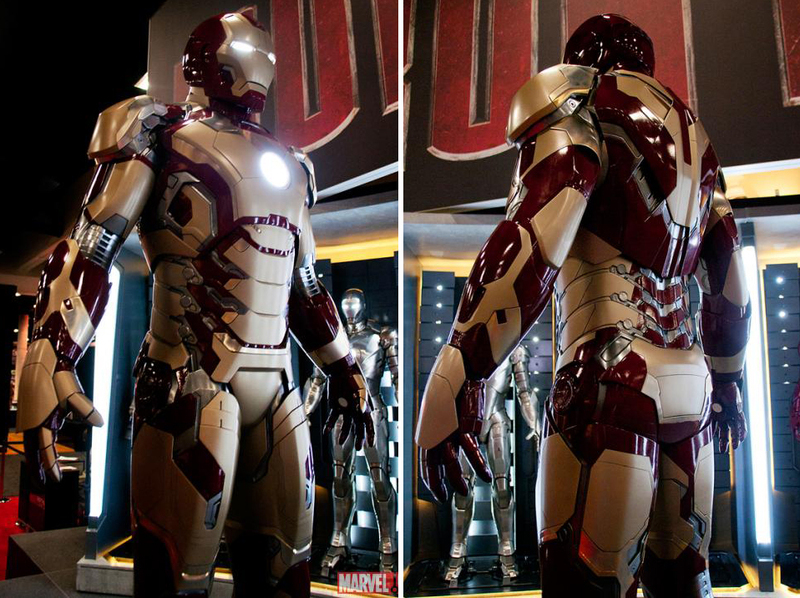 I liked the armor from the end of the Avengers, but I guess we won't have it long. 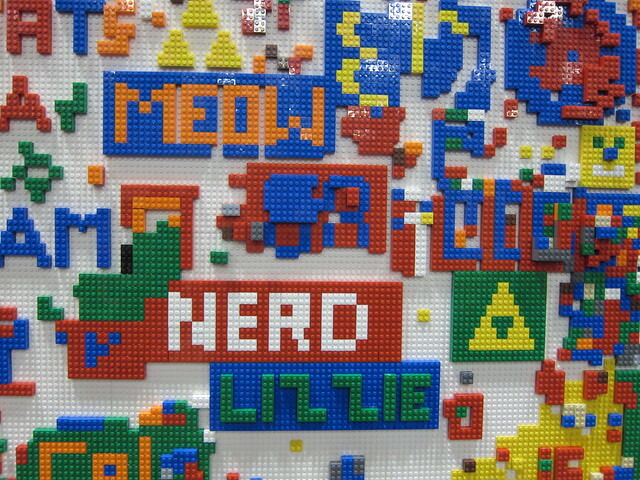 The Lego booth was fun, and they had lots of audience-participation stuff. 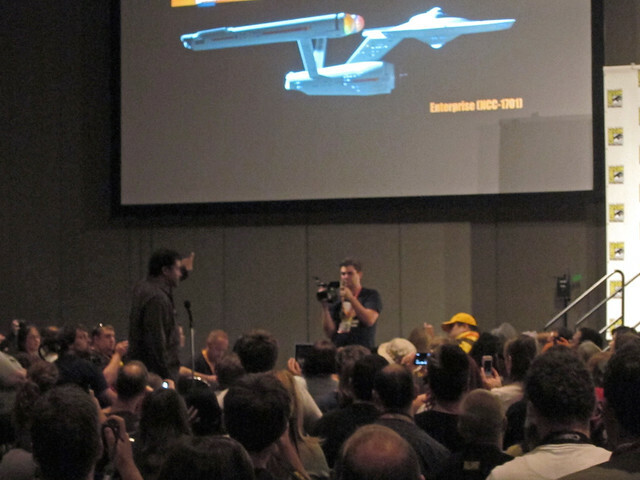 For the last two years, we've ended the convention by going to Starship Smackdown. 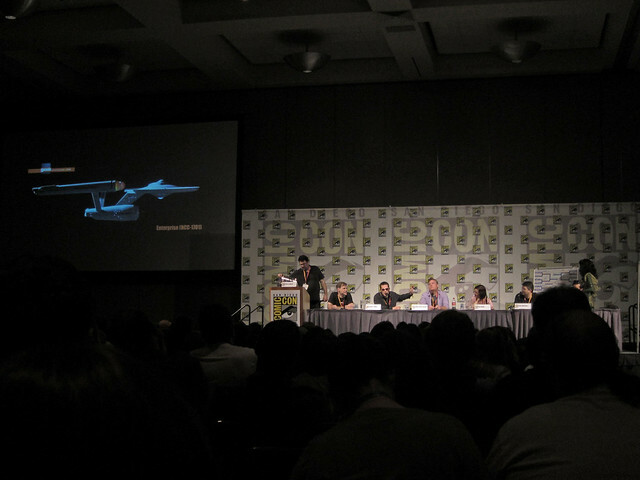 It's a panel where a bunch of geeks (some of whom have some nice credits to their names, but nobody extremely famous) argue over what spaceship would win if various sci-fi ships battled each other. As we discovered last year, it's hilarious (there are rules like "no animated ships, since they aren't real"), and it just feels like a good way to close out a geek convention. It's way more fun than seeing the Buffy musical, which was showing in another room (we tried that once, but it was a letdown, especially since the audience participation seemed limited to booing Dawn). The Smackdown was bigger than ever this year, but still just as funny. At one point one of the panelists was offering to change her vote for a Fringe fedora; I was about to give her mine, just to see it happen, but I couldn't remember what her vote was for in that round (I was rooting for an Enterprise vs Enterprise finale), and then the moderator moved on and the moment was lost. The Dark Star stayed in the running a lot longer than I thought it would (it kept winning because "You can't fight crazy"). 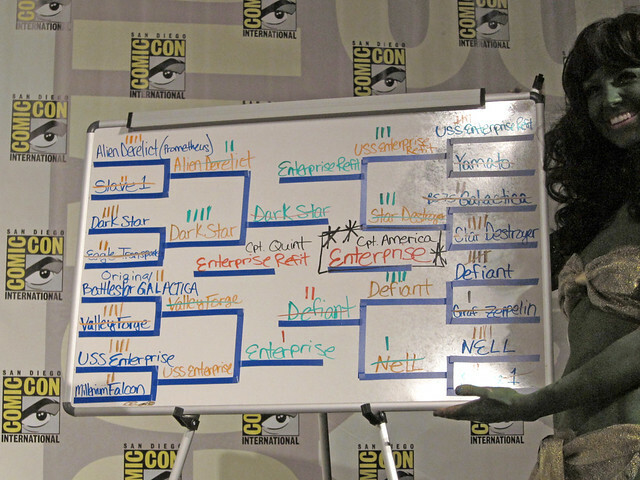 Ultimately, though, the final round did come down to Enterprise (original) versus Enterprise (refit). The votes were tied, and the moderator shook things up by drawing names for new captains (for this, I think they'll use anyone with "Captain" in their name; you could probably end up with Captain Kangaroo): Captain America for the original Enterprise, and Captain Quint from Jaws for the refit. At that point you'd think it was pretty well sewn up, but the debate continued. The panel was running badly over time by then (the convention is supposed to end at 5:00, and it was already later) and I was starting to worry that they'd get rushed to a conclusion. And NEIL DEGRASSE TYSON GRABBED THE MIKE. SERIOUSLY. 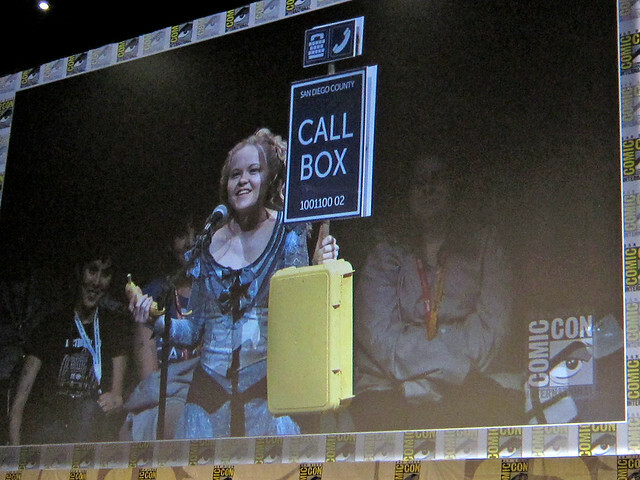 It was possibly the most awesome thing that has ever happened at Comic-Con. 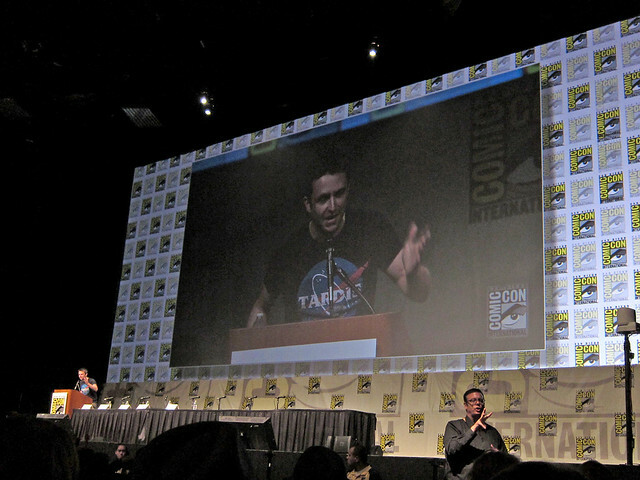 He gave an impassioned speech about wonder and inspiration, defending the original Enterprise, and everyone was rapt. 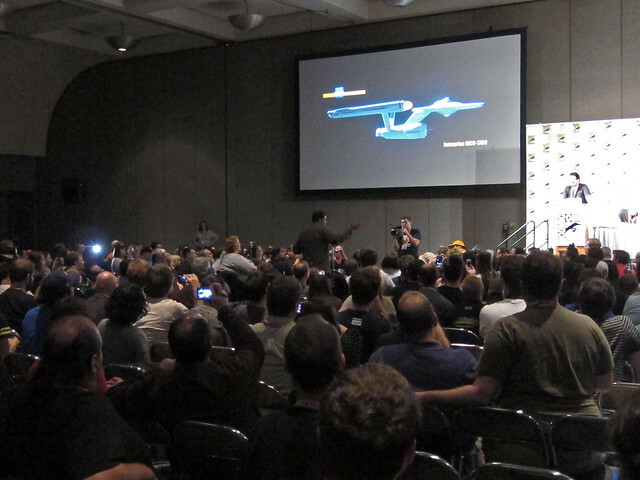 I don't know why they even bothered doing an audience-applause vote after that, but the original Enterprise won by a landslide. Kay Reindl, the panelist who wanted the Fringe hat, blogged about the panel here; she captures the awesomeness of the moment admirably. 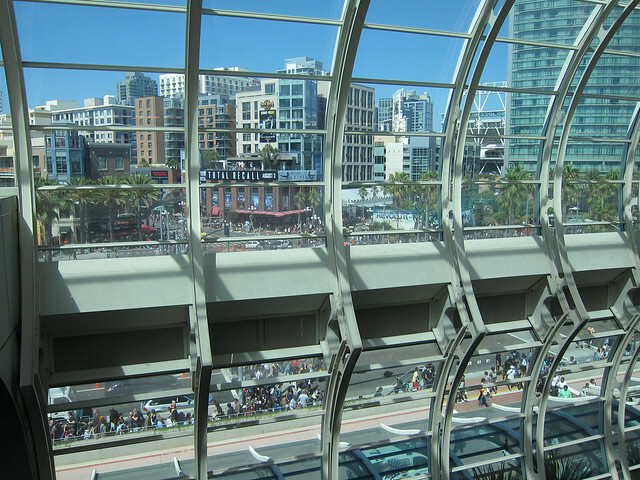 It really was one of those legendary Comic-Con things for which you had to be there, caught up in it, and for once I WAS. I am so glad we were there. 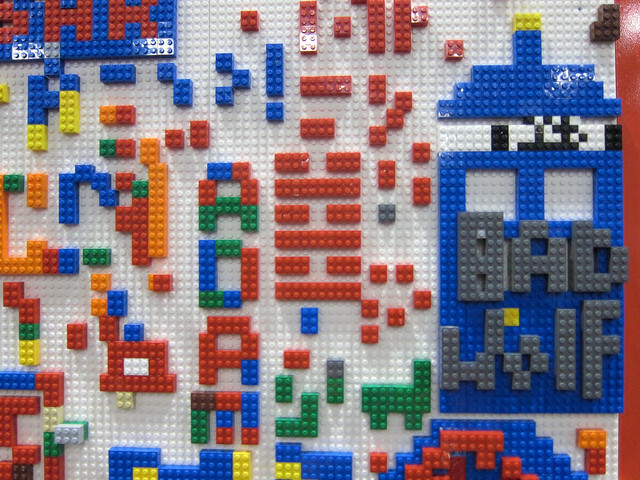 The board, as it stood at the end. 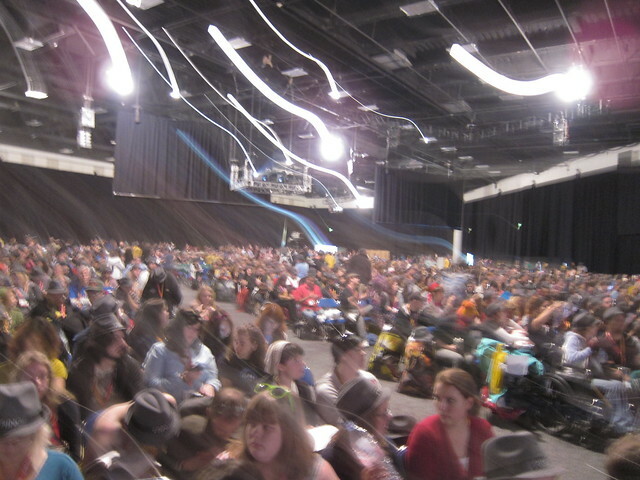 So that was the best imaginable way to end what really was a very awesome convention. I didn't want the day to end; we staggered out into the Gaslamp in giddy exhaustion (well, I was giddy and exhausted, at least) and stopped one last time at Gaslamp Pizza (that stuff is good, man). We wound down while eating our pizza on the sidewalk by a little park, and then it was time to take the trolley home. And SHOWER. I think that was the best shower of my life. 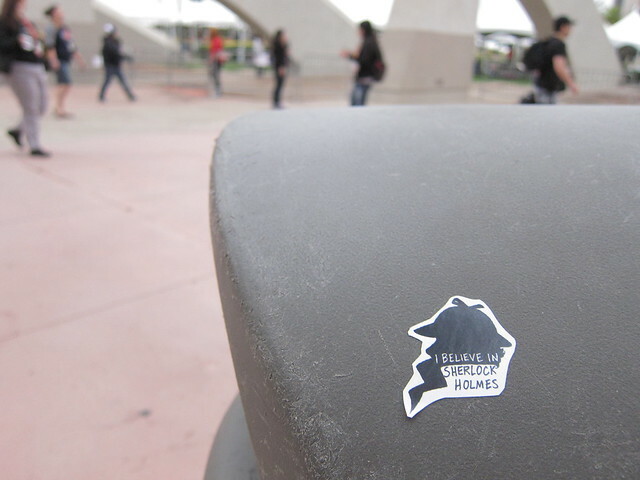 So, that's SDCC 2012. 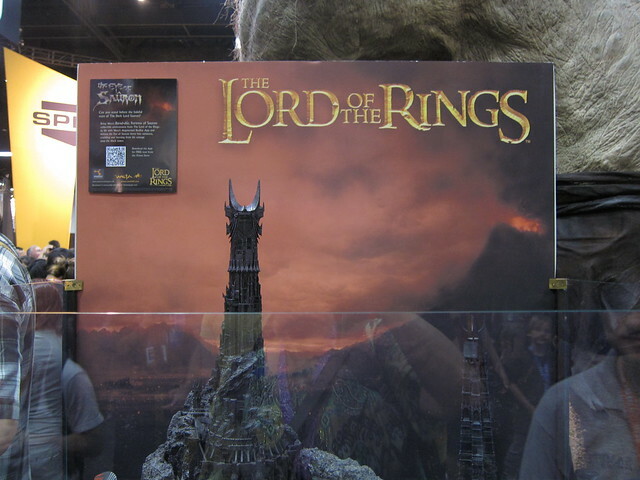 I'm looking forward to 2013 -- assuming I can get a badge -- and maybe thinking of taking it a little more casually, avoiding the giant panels, trying to wander around more and see some of the smaller-scale stuff. But that was my original plan for this year as well. We'll see. Whatever happens, I'm sure it'll be awesome.